^ a b c d Office of Data and Economic Analysis, 2006:6. ^ a b c d e f g h i j k l m n o p q r s t u v w x y z Lamb, 2003. ^ a b Hayler, 2003:5–13. ^ a b c d e f Bruno-Stéphane Duron, Le Transport maritime des céréales[リンク切れ], mémoire de DESS, 1999. ^ a b c d International Maritime Organization, 1999:1. ^ International Maritime Organization, 1999: 1, 2. ^ 資料によって分類はわずかに異なる、MAN Diesel Group 2005, p.4. UNCTAD 2006, p. xii. ^ a b c d e MAN Diesel Group, 2005, p. 3-4. ^ a b “Handysize re-vamp: the next move in bulk carriers?”. The Naval Architect. (January 2006). ^ Autoridad del Canal de Panamá 2005, pp. 11 – 12. ^ a b International Maritime Organization, 1999:6. ^ Office of Data and Economic Analysis, 2006:1. ^ Lloyd's Register World Fleet Statistics Tables. London: Lloyd's. (2000). http://www.lrfairplay.com. ^ a b Office of Data and Economic Analysis, 2006:1. ^ a b UNCTAD 2006, p. 21. ^ a b UNCTAD 2006, p. 23. ^ Office of Data and Economic Analysis, 2006:2. ^ a b Office of Data and Economic Analysis, 2006:4. ^ According to description of the main ship-owners, from the French Marine-Marchande website. ^ a b c d Office of Data and Economic Analysis, 2006:5. ^ a b c d e f g UNCTAD 2005. ^ Maritime Transport Coordination Platform (November 2006). “3: The London Tonnage Convention” (pdf). Tonnage Measurement Study. MTCP Work Package 2.1, Quality and Efficiency. Bremen/Brussels. pp. 3.3. オリジナルの2007年3月30日時点によるアーカイブ。. https://web.archive.org/web/20070330134300/http://ec.europa.eu/transport/maritime/studies/doc/2006_11_tonnage_measurement_study.pdf 2007年5月29日閲覧。. ^ a b c d e f g h i j Lane, Tony (2001). Bulk Carrier Crews; Competence, Crew composition & Voyage Cycles. Cardiff University. ^ a b c d e Packard, William V. (1985). Sea-trading. Fairplay Publications. ^ a b c International Maritime Organization, 1999:7. ^ a b c Hayler, 2003:5–13. ^ a b c Ewart, W.D. (1984). 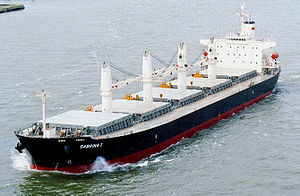 Bulk Carriers. Fairplay Publications Ltd,. ISBN 0-905045-42-4. ^ International Maritime Organization, 1999:7. ^ a b International Association of Classification Societies 2007, p. 21-1. ^ International Maritime Organization, 1999:8. ^ “Concrete sandwiches: structural strength and safety for bulk carriers”. The Naval Architect. (February 2005). ^ “NG-Bulk20: a new Turkish double-skin bulker design”. The Naval Architect. (November 2005). 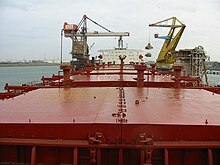 ^ “Double-skin bulkers: paradise or problem?”. The Naval Architect. (May 2003). ^ a b George, 2005:217. ^ a b George, 2005:218. ^ a b International Maritime Organization, 1999:8. ^ “Implications of commons structural rules”. The Naval Architect. (March 2006). ^ International Maritime Organization, 1999:2. ^ International Maritime Organization, 1999:1,2. ^ a b International Maritime Organization, 1999:4. ^ a b c Kemp, John F. (1971). Notes on Cargo Work (3rd ed.). Kandy Publications. ISBN 0853090408. ^ a b International Maritime Organization, 1999:5. ^ International Maritime Organization, 1999:5,6. ^ International Maritime Organization, 1999:7,8. Autoridad del Canal de Panamá (2005). MR Notice to Shipping Number N-1-2005.. Notices to Shipping. Balboa-Ancon: Autoridad del Canal de Panamá. pp. 11–12. http://www.pancanal.com/eng/maritime/notices/n01-05.pdf 2008年4月1日閲覧。. Frankel, Ernst G. (1985). Bulk Shipping and Terminal Logistics. ISBN 082130531X. George, William (2005). Stability and Trim for the Ship's Officer. Centreville, MD: Cornell Maritime Press. ISBN 978-0-87033-564-8. Hayler, William B. (2003). American Merchant Seaman's Manual. Cornell Maritime Pr. ISBN 0-87033-549-9. Isbester, Jack (1993). Bulk Carrier Practice. ISBN 1870077164. Lamb, Thomas (2003). Ship Design and Construction Vol. I. Jersey City: Society of Naval Architects and Marine Engineers. ISBN 0-939773-40-6.
International Association of Classification Societies (2007). “21: Evaluation of Scantlings of Hatch Covers and Hatch Coamings of Cargo Holds of Bulk Carriers, Ore Carriers and Combination Carriers (Rev. 4)”. 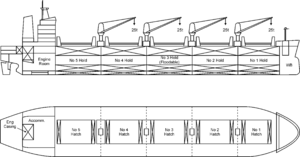 Requirements Concerning Strength of Ships. Unified Requirements. International Association of Classification Societies. pp. 21–1. オリジナルの2008年5月30日時点によるアーカイブ。. https://web.archive.org/web/20080530021754/http://www.iacs.org.uk/document/public/Publications/Unified_requirements/PDF/UR_S_pdf158.PDF. Thompson, Mark L. (1994). Queen of the Lakes. ISBN 0814323936. United Nations Council on Trade and Development (UNCTAD) (2005). Review of Maritime Transport, 2005. New York and Geneva: United Nations. オリジナルの2008年5月13日時点によるアーカイブ。. https://web.archive.org/web/20080513201212/http://www.unctad.org/Templates/StartPage.asp?intItemID=2614&lang=1. United Nations Council on Trade and Development (UNCTAD) (2006). Review of Maritime Transport, 2006. New York and Geneva: United Nations. http://www.unctad.org/en/docs/rmt2006_en.pdf. Zera, Thomas F. (1996). Ore-Oil Bulk: Pictorial History of Bulk Shipping Losses of the 1980s. ISBN 0964393778.